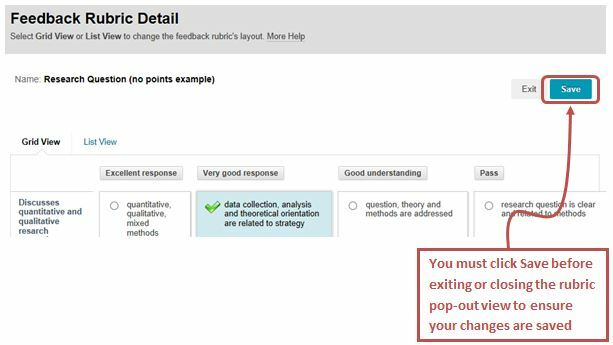 You must not start marking using the panel view (shown below) and then open the pop-out view without first saving the feedback already entered by clicking the Save Feedback Rubric button at the bottom of the panel. Similarly you must not start marking using the pop-out view and then open the panel view without first saving the feedback already entered on the pop-out view by clicking the Save button. You must click the Save button on the pop-out view (shown below) to save the feedback you have entered. If you click Exit or close the pop-out view before saving, your changes won’t be saved and you will lose the feedback. When you save a Feedback Rubric you must enter a mark against the attempt (below). 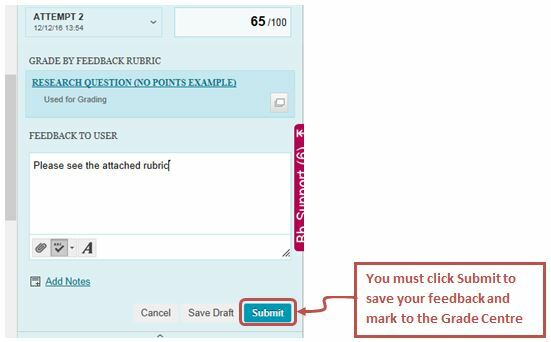 If you subsequently edit a completed Feedback Rubric you must make sure that the mark has not reverted to 0 (zero). 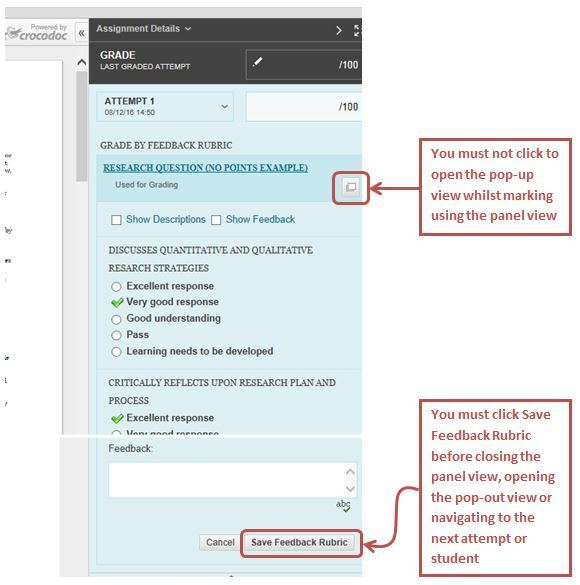 Once you have entered the correct mark, you must click the Submit button in the Feedback to User section (shown below) to save your feedback and mark to the Grade Centre. By considering the above guidance, you will successfully complete your marking and save all your feedback ready to be released back to the students. If you have any questions about creating or marking using Feedback Rubrics, please talk to your Faculty TEL team.